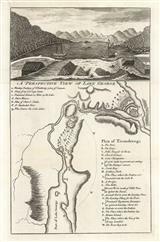 Description: A view of Lake George and a plan of Fort Ticonderoga - formerly Carillon - which was a site of great strategic importance during the American Revolutionary War. Description: New York. Early plan of the New York State, showing the early settlements in Manhattan, and Long Island. 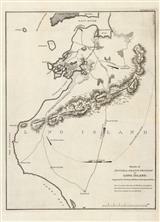 Description: Sketch map showing General Grant's position on Long Island during the Revolutionary War. 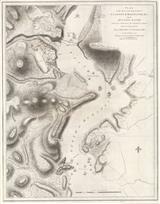 Description: Elegant map showing the position that the army under Lt. Gen. Burgoine took at Saratoga. 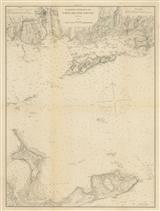 Description: Large, detailed map in original colour, surrounded by text describing the History and Geography. 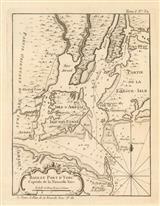 Description: Map of New England and New York at the end of the Nine Years' War. Coloured. Description: Map of the State of New York including Lake Erie, Lake Ontario, and part of Upper Canada. Inset plan of Manhattan. Coloured. Description: Detailed map of New York State. Cross section of canals along the lower left. Original colour. Description: Attractive state map with decorative borders and original colour. 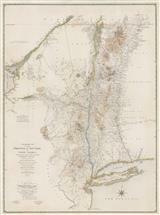 Description: State of New York with inset maps of Albany, Troy, New York City, Syracuse, Rochester, Buffalo and Oswego. Set within a decorative border. Original hand colour. Description: State map. Inset of Hudson River. Original colour. Description: Long Island Sound from Stratford Point to Norwalk River. 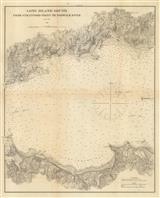 Detailed sea chart published by the United States Coast and Geodetic Survey.